Longtime critic of the US president, former talk show host Rosie O’Donnell has opened up on MSNBC about her depression after Donald Trump was elected. 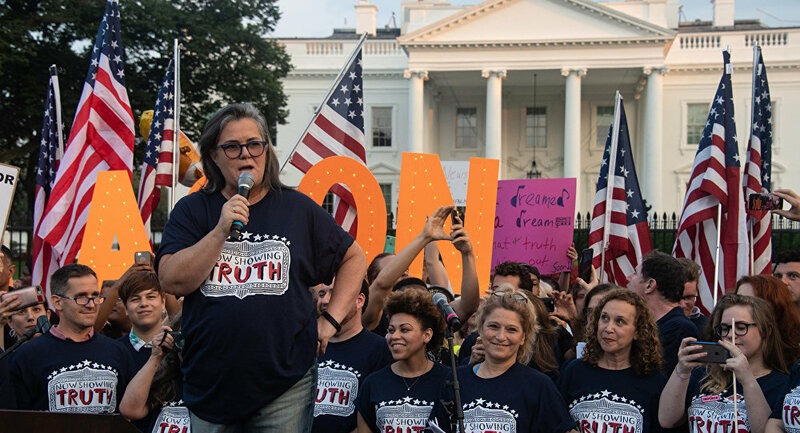 During her appearance on Nicolle Wallace’s MSNBC show, “Deadline: White House,” Donald Trump’s arch-nemesis Rosie O’Donnell said she wanted to send the US military to the White House to “get” the president, drawing the laughter of journalists and pundits. — Deadline White House (@DeadlineWH) 18 октября 2018 г. Her comment was made during a discussion of Trump’s reported intention of sending the military to the country’s southern border to halt an alleged caravan of illegal migrants moving towards the United States. O’Donnell also claimed that she had taken a “year out of the spotlight” to deal with her depression after Trump was elected, adding that she “got physically sick” the night he won. The actress and comedian reminded Wallace that she had previously called for “martial law” to be introduced until it could be proved that the allegations of Russia’s meddling in the final vote were untrue. “What I wrote on Twitter was we should impose martial law until we make sure the Russians weren’t involved in the final tally of the votes… And people were like, ‘Martial law? What’s wrong with you?’” Rosie added. — GeneRayle (@gene_rayle) 19 октября 2018 г. The French have a word for this, it coup d'etat. There's another word for it too. It's called treason, and no it doesn't mean colluding with another country in an election. It means attempting to kill the ruler or overthrow the government of a particular nation. — Warp Space Podcast (@warp_podcast) 19 октября 2018 г. — ❌DarkestColor❌ (@ColorDarkest) 19 октября 2018 г. — jacquie chapman (@JacquieChapman) 19 октября 2018 г.
Can’t we use the military to get her out? That would truly help in Making America Great Again. — CE (@chengler) 19 октября 2018 г. We want Rosie removed from our Country too. Why is she still here? She was suppose to leave if Trump got elected….so time to hit the road Rosie….you've been here way too long…..
— Mona Greer (@kentuckylady717) 19 октября 2018 г.
Didn’t she say she was moving to Canada? — T. Poch (@TPoch23) 19 октября 2018 г. — marcs (@RealEstateMarc) 19 октября 2018 г. @Rosie you should take several more years out of the spotlight. — Dave Friend (@dfriend2001) 19 октября 2018 г. @Rosie trust me a year was not long enough. You and MSNBC should just disappear from the public Spotlight all together. — Andrew nelson (@Byu4288) 19 октября 2018 г. — D D (@DiltzDavid) 19 октября 2018 г. Love you @Rosie Thank you, you and people like Nicole & @maddow help me feel sane when things sometimes seem upside down! — Fringephile (@fringephile) 18 октября 2018 г. — Chris Michael Ward (@ChrisMichaelW) 18 октября 2018 г. Excellent show today and Rosie was fantastic. — WonderWoman #RESISTS your misogyny. #FightItAll (@AlsoWonderWoman) 19 октября 2018 г.
Trump and O’Donnell have a long history of back-and-forth war of words, having continuously exchanged incendiary remarks since 2006 when both were TV stars. During the first Republican primary presidential debate, Trump infamously joked that he had only referred to Rosie, and not any other women, as a “fat pig” and a “slob” in the past. Days before Trump’s inauguration in January 2017, O’Donnell tweeted that she “fully supports” the imposition of martial law until an investigation into the results of the election is completed. — ROSIE (@Rosie) 12 января 2017 г. — ROSIE (@Rosie) 6 января 2017 г.